The transposition of the great arteries is the most common cyanotic heart disease in newborns. The transfer of the coronary arteries during arterial switch operation is the principal step; the long-term morbidity and mortality of this operation depend on the status of the coronary perfusion, and coronary obstruction is an important cause of death. However, severe coronary artery lesions may occur in asymptomatic patients, and unfortunately, many noninvasive tests are not sensitive enough to show stenosis or occlusion. This may be related to retrograde perfusion from collateral arteries which protect the myocardium. We present an asymptomatic patient with a left anterior descending coronary artery originating from the pulmonary artery as a complication of incomplete transport during the arterial switch operation. A 16 year old post-operative, asymptomatic boy was undergoing cardiovascular evaluation. The patient had undergone arterial switch operation at 4 months of life for transposition of the great arteries, ventricular septal defect, and pulmonary hypertension and was discharged without any problem. Following the arterial switch operation, he had been followed up with no symptoms until when an echocardiographic examination at 5 years of age revealed mild-to-moderate aortic valve insufficiency and a flow disturbance in the interventricular septum. 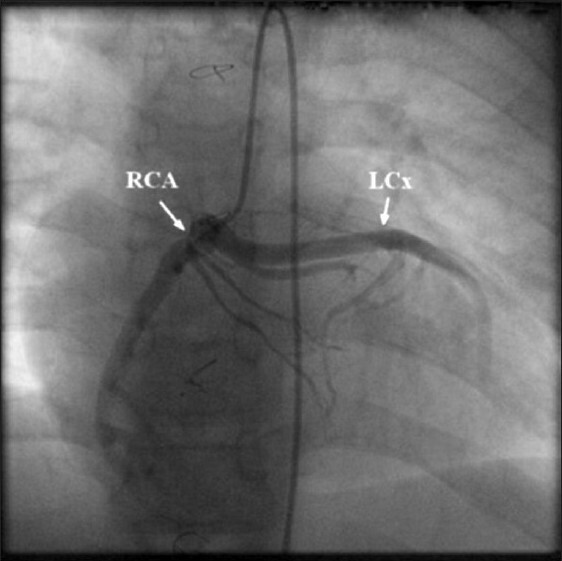 Cardiac catheterization and angiography demonstrated that the left circumflex artery was arising from the right coronary artery and the left anterior descending coronary artery from the pulmonary artery which accompanied abundant intramyocardial collaterals [Figure 1] and [Figure 2]. When we reviewed the details of surgery, we noticed that the single coronary artery was transported to the neoaortic root, whereas the small conal artery was not transported because of technical difficulty (possibly this was the left anterior descending artery). The child was reevaluated at 15 years of age, after an irregular follow-up period, during which he had no symptoms. His electrocardiogram was normal, with no change in the ST-T segment. We performed thallium scintigraphy which revealed no myocardial ischemia. Repeat coronary angiography revealed mild-to-moderate aortic valve insufficiency and stenosis of the pulmonary bifurcation similar to the previous examination. Because of the high risk of sudden death, surgical intervention was planned. Coronary events after arterial switch operation are not uncommon and may cause late death; patients should be followed up and screened at regular periods. Conventional angiography and multislice computed tomography should be widely performed in this patient group. , Imperfect or incomplete transfer of the coronary arteries to the neoaorta is related with severe ischemic changes and acute or subacute cardiac failure. Our patient, in spite of incomplete transfer of coronary artery, was asymptomatic due to the development of intramyocardial collaterals originating from the aortic region leading to retrograde perfusion and steal into the neopulmonary region. We learn from this case that patients with the transposition of the great arteries who underwent arterial switch operation should be evaluated carefully for any acquired coronary anomalies associated with arterial switch operation. The anomalous origin of the left anterior descending artery from the pulmonary artery may potentially lead to sudden death which warrants consideration of the surgical correction in high-risk subjects. 1. Levin DL, Paul MH, Muster AJ, Newfeld EA, Waldman JD. d-Transposition of the great vessels in the neonate: A clinical diagnosis. Arch Intern Med 1977;137:1421-5. 2. Legendre A, Losay J, Touchot-Koné A, Serraf A, Belli E, Piot JD, et al. Coronary events after arterial switch operation for transposition of the great arteries. Circulation 2003;108:II186-90. 3. Bonhoeffer P, Bonnet D, Piéchaud JF, Stümper O, Aggoun Y, Villain E, et al. Coronary artery obstruction after the arterial switch operation for transposition of the great arteries in newborns. J Am Coll Cardiol 1997;29:202-6. 4. Ioannis V, Michael IH, George EK, Panos EV. Acute coronary syndrome in an adult with anomalous origin of the left anterior descending coronary artery from the pulmonary trunk. Int J Cardiol 2007;121:323-5. 5. Kasprzak JD, Al-Shaibi K, Ahmed W, Chamsi-Pasha H, Nosir YF. 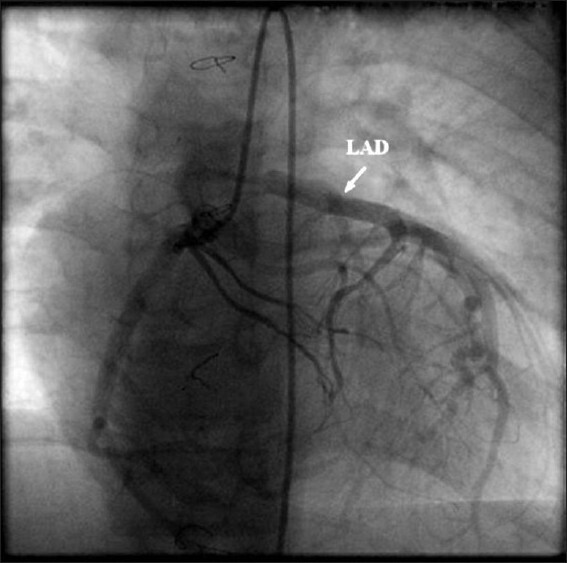 Anomalous origin of the left coronary artery: The rare coincidence of the left anterior descending coronary artery originating from the pulmonary artery and the circumflex coronary artery originating from the right sinus of valsalva. Rev Esp Cardiol 2008;61:1107-8. 6. Morentin B, Pecina T, Anguilera B. Sudden death due to an anomalous origin of the left anterior descending coronary artery from the pulmonary trunk in a 9-year old boy. Rev Esp Cardiol 2000;53:294-6. 7. Turley K, Szarnicki RJ, Flachsbart KD, Richter RC, Popper RW, Tarnoff H. Aortic implantation is possible in all cases of anomalous origin of the left coronary artery from the pulmonary artery. Ann Thorac Surg 1995;60:84-9.